Is Boston a good place to start a small business? For Marcus Johnson-Smith, co-founder of Kush Groove Clothing Company, Boston was the obvious choice. Less than a year ago, Kush Groove Clothing Company launched a line of high-quality, brightly-colored t-shirts stamped with original designs. Marcus grew up in Cambridge and went to Northeastern University for college and graduate school, so he understands his local market. He loves both his hometown and the massive college-going crowd that passes through it every year. Perhaps most important of all for Kush Groove (do yourself the favor of clicking on that link), though, is the vote Massachusetts residents cast in 2008 to decriminalize marijuana possession. Now, why would law about cannabis impact an apparel company? “The relaxation of marijuana, in terms of it becoming decriminalized, for us reflected where people stood with it – where our target market stood with it on a policy level,” said Marcus. Marcus in a Kush Groove Clothing Company t-shirt. Audio transcription: 420 culture is the celebration of smoking weed, to be blunt. It’s the pre-game before going out. It’s hanging out with folks, drinking beers, having some liquor, smoking a cigarette or so, listening to music, watching a movie – but under the influence of being stoned. That’s what it’s about at its core. A classic Kush Groove Clothing Company design at Got Sole in Jamaica Plain, Mass. Marcus, though only 26 years old, has consciously made himself open to epiphanies. He used his senior year of college to write a book on the emerging adulthood experience, and left a comfortable job at the prestigious Boston Foundation to launch his business. The name Kush Groove comes from the 1985 movie Krush Groove. 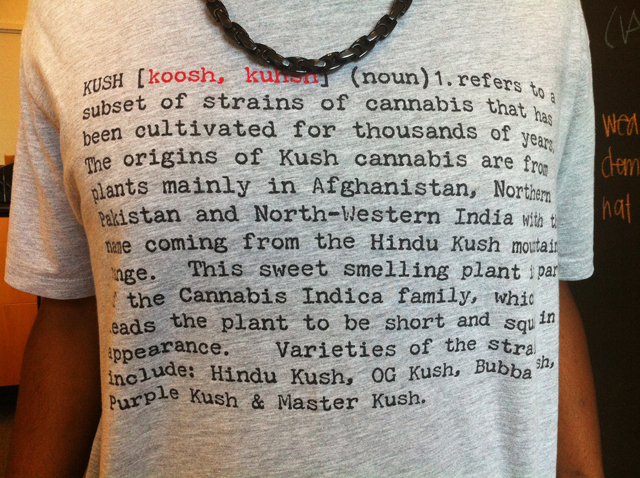 But Kush, unlike Krush, is the name of a strain of cannabis. Audio transcription: The name Kush Groove is a namesake of the movie Krush Groove that came out in the mid-80s. It was a cult flick that really told the story of Def Jam Records and the rise of hip-hop as a mainstream genre. And so for us, we wanted to use the theme of Krush Groove the movie with a little spin. Rather than use the word “Krush” we wanted to use the word “Kush” to symbolize the celebration of the 4:20 movement, which our brand is about. 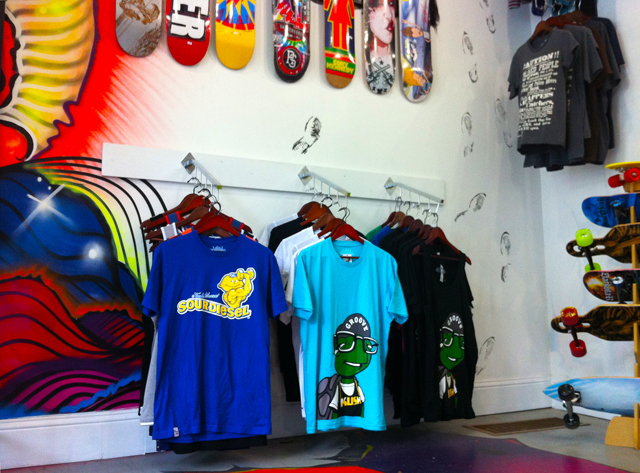 Got Sole, a new sneaker and skateboard store at 617 Centre Street in Jamaica Plain, Massachusetts, sells Kush Grove Clothing. Kush Groove clothing is available at Got Sole in Jamaica Plain, Massachusetts and Kulturez in Harvard Square. Green Street Vault, which is kind of like a food truck except that it sells apparel instead of food, did a Kush Groove promotion on April 20th (4/20) of this year. Marcus rode around with the Green Street Vault team, stopping at different locations to sell gear from the truck and hang out with 420-loving Bostonians. 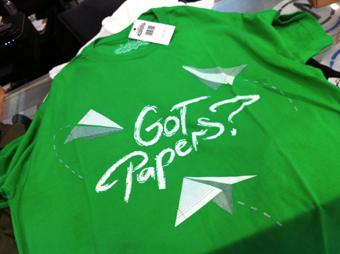 The company also presented its clothing at a fashion show at nearby Tufts University. With the help of these small local businesses and institutions, Kush Groove is proliferating. Last month the company got its products into ThreadZ, a store in Atlanta, Ga.
Find Kush Groove on Twitter, Facebook, and Instagram.